There have been many moral conflicts over the centuries, but none so painful to the individual than to watch the suffering of a loved one and to be prevented by ethics, law, distance, lack of knowledge or resources to either ease or end that suffering. 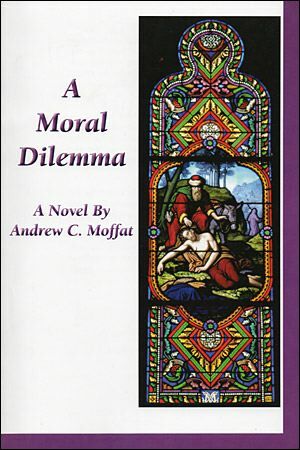 The ultimate moral assault occurs when one knows that there is no longer a relief for the ever-increasing pain and that the cause inevitably leads to a prolonged and agonizing death. You have the means and the knowledge for ending it — but you must consider the moral and ethical guidelines — as well as the legal ones. If you were in such a position and you found that you had a solution to resolve a loved one’s terminal pain… would you take it? The boy had, like his parents, been praying with his eyes closed and his head hidden in his folded arms. Without any conscious thought, but under some strange compulsion, he slowly raised his head and opened his eyes. The ray of sunlight passing through the stained glass at the centre of the apse shone directly on his face. He should, by all logic, have been blinded… but he wasn’t! The picture depicted by that stained glass window was as clear as it could possibly be. His sight seemed to flow up that beam of bright, multi-coloured light until he was focused on the window through which it flowed. The window was a depiction of The Good Samaritan kneeling by the roadside to give aid to the injured traveller.